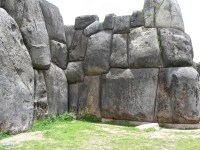 Of the four ruins near Cusco, Sacsayhuamán is the closest and the most remarkable. Its proximity to Cusco and the dimensions of its stones caused it to be used as a quarry by the Spanish conquistadors, providing building material for their colonial buildings in the city below. The complex suffered such destruction by the Spanish that little is known about the actual purpose these magnificent buildings once served, but it is usually referred to as a fortress, constructed with high, impenetrable walls, although it is also believed to have been a ceremonial or religious centre. The ruins cover an enormous area, but only about 20 percent of the original complex remains, providing a fine example of extraordinary Inca stone masonry. It is estimated the complex took about 100 years to build, using thousands of men in its construction. The massive blocks of stone fit together perfectly, without the aid of mortar, each one weighing over 300 tonnes and standing 16ft (5m) tall. The magnificent centre was the site of the infamously bloody battle between the Spanish and the Inca people in 1536 that left thousands of the native people dead, providing food for the circling condors; ever since then the Cusco Coat of Arms has featured eight condors in memory of the event. Today it holds the annual celebrations of Cusco's most important festival, Inti Raymi, the sun festival, a spectacular and colourful affair that re-enacts the Inca winter solstice festival every June. Transport: A steep 40 minute (2km) walk up from the Plaza de Armas.